That's far too many acronyms, really. What do they mean? Well, readers of this blog will understand that TDI has got nothing to do with diesel engines but is, in fact, Tivoli Directory Integrator. MQTT? MQ Telemetry Transport - "a machine-to-machine (M2M)/"Internet of Things" connectivity protocol". RSMB? Really Small Message Broker - "a very small messaging server that uses the lightweight MQTT publish/subscribe protocol to distribute messages between applications". I have no intention (yet) of trying to copy Andy's achievements as I'm quite sure I don't have the spare hours in the day! 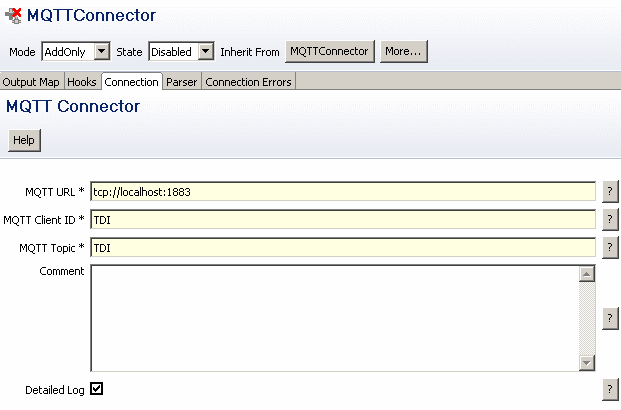 However, I was intrigued to see if I could use my favourite tool (TDI) to ping messages to RSMB using MQTT. Step 5 - Populate the output map of my connector and run the Assembly Line. 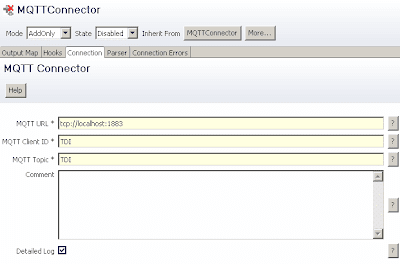 Of course, TDI doesn't have an MQTT Publisher Connector - I had to write one. The good news is that this was possibly the simplest connector of all-time to write. That said, it is extra-ordinarily basic and is missing a myriad of features. For example - it does not support authentication to RSMB. It's error handling is what I can only describe as flaky. It is a publisher only - I haven't provided subscriber functions within the connector. But it shows how TDI could be used to ping very simple lightweight messages to a message broker using MQTT. So what? Sounds like an intellectual exercise, right? Well, maybe. But MQTT is a great way of pushing information to mobile devices (as demonstrated by Dale Lane) so what I have is a means of publishing information from my running assembly lines to multiple mobile devices in real-time - potentially. At this point, though, it is worth pointing out that the development of a connector is complete overkill for this exercise (though it does look pretty).